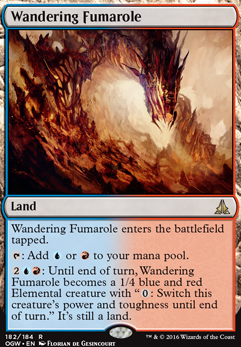 : Until end of turn, Wandering Fumarole becomes a 1/4 blue and red Elemental creature with ": Switch this creature's power and toughness until end of turn." It's still a land. Fabricate is a pretty good artifact tutor that I think you could find space for. Temple of Epiphany and Wandering Fumarole can upgrade the mana base a bit for not too much $$ investment. 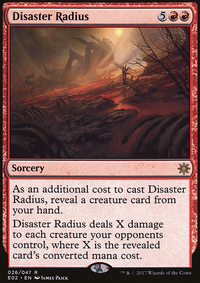 Sadly, U/R duals are the most expensive out there as Steam Vents , Sulfur Falls and Spirebluff Canal are all $10+. 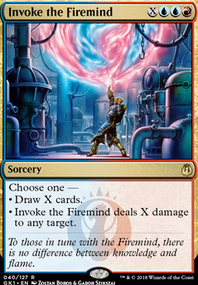 A piece or two of targeted removal may be in order as well: Chaos Warp , Pongify , Rapid Hybridization or Curse of the Swine I especially like the exile part on Curse. No counter magic at all? 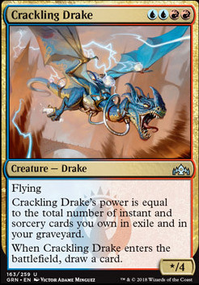 I know some tables can have a real visceral reaction if a deck runs an oppressive level of counters but would Negate / Swan Song to stop that one big spell that just blows people out of the water be out of place? I will add my vote for Mirage Mirror being great and not just for cloning artifacts but for becoming whatever you need it to be at the right moment. Clone whatever is the best threat on the field or change its type in response to removal to have it sneak away unscathed. 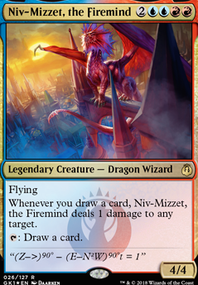 There is a simple (and cheap money-wise) infinite combo: Niv-Mizzet, Parun/Niv-Mizzet, the Firemind + Curiosity/Ophidian Eye/Tandem Lookout + any draw. 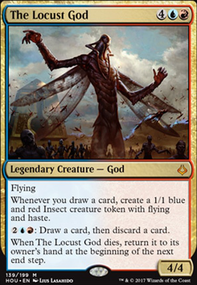 Draw, then deal 1 damage with Niv-Mizzet, then draw, then deal 1 damage, then draw, then... to kill all your opponents. 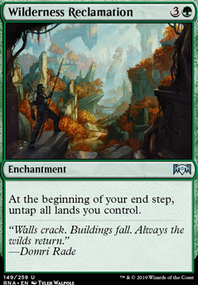 // Maybe you should run more ways to guarantee you can cast your commander: Swiftwater Cliffs, Izzet Boilerworks, Evolving Wilds, Terramorphic Expanse, Command Tower, Shivan Reef, Wandering Fumarole, Temple of Epiphany, Myriad Landscape, Lonely Sandbar, Forgotten Cave (they can uncounterably start the infinite combo with the cycling abitily), Izzet Signet, Gilded Lotus, Darksteel Ingot, Izzet Cluestone, Commander's Sphere (they can also start the infinite combo right away).